Is there a cause or issue you’re tackling, and you want to raise public awareness? We talked about gaining media attention by writing press releases in this blog as a way to help communicate your organization’s efforts to your community. 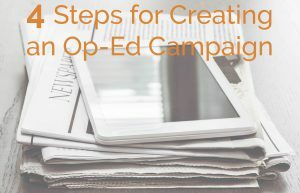 Another strategy for building awareness around your work is to kick off an op-ed campaign. An op-ed is an opinion piece written by a freelance writer, usually on behalf of an organization or nonprofit. ANYONE can write an op-ed, and it can be a great strategy for educating the public on a cause, an event or sharing opinions about an issue. Too often nonprofits are so focused on providing great services and programs that they forget about educating others in the community about the important issues they are working to address. You don’t need a marketing firm to implement this work if you follow the steps below. What do you want your op-eds to communicate? While you may have several people contributing letters with different angles (see step 2), you want to communicate a consistent message. Even though the letters submitted will come from a variety of people with various angles, they must have this consistent theme throughout. The number of writers and op-eds aren’t as important as who you choose to write. It is important to have a diverse group of writers who are well-respected and well-known people in your community. You want writers who the public will listen to. You also want different backgrounds and angles so that at the end of your op-ed campaign, you have communicated the FULL story. The “messengers” are just as important as the “message”. You should think about having folks on the receiving end of your services, if appropriate, share their perspective. You will also want to have unusual stakeholders contribute. For a campaign to raise awareness about early learning, you might want to have your chamber write an op ed about how it affects workforce development. Outreach: Someone needs to make the formal “ask.” This could be a staff member, volunteer, or donor, but it’s helpful that the “ask” comes from someone who already has a relationship with your prospect. Educate: Make sure the writer understands your overall goals. Provide the writer with background information and possible data to incorporate in their letter. Brainstorm specific talking points and the angle you want them to take. The more information you can provide, the more likely they are to stay on message and align with your overall goals. Create a template: While you want the writer to feel free to express their own thoughts and opinions, it is helpful to create an outline, talking points or template for them to follow. This will keep them on track and alleviate any confusion they may have as they begin the writing process. Think of some of the questions they may ask: How long should my letter be? What is the timeline? What areas should I focus on? What is the call to action or conclusion? Creating a tips sheets for writing op-eds will help your writers draft a compelling story that will engage the audience. Edit: Decide who will edit the letters and make sure they explain any suggested changes to the writer. You want the writer to stay engaged throughout the entire process, and you want them to feel proud to have their name attached to the final piece. Submit the letter: Determine who will submit the letters, and where they will be submitted. In some communities, newspapers ONLY accept letters from locals. Do your research on the submission process and any requirements. If the writer is submitting the letter, provide them clear steps for submitting it with all contact information for the local newspapers to make the process as simple as possible. Real people are going to be attaching their names to these op-eds, and you want their personal voices to shine. Encourage your writers to share real-life examples and their personal experiences about how this issue has impacted them. Nobody wants to pick up the newspaper and read an op-ed that looks like a research paper. Ultimately, readers want a story that engages them and relates to them. At Transform Consulting Group, we want to help you communicate your work and build awareness for the important causes you’re working to address. Contact us today for a free consultation!